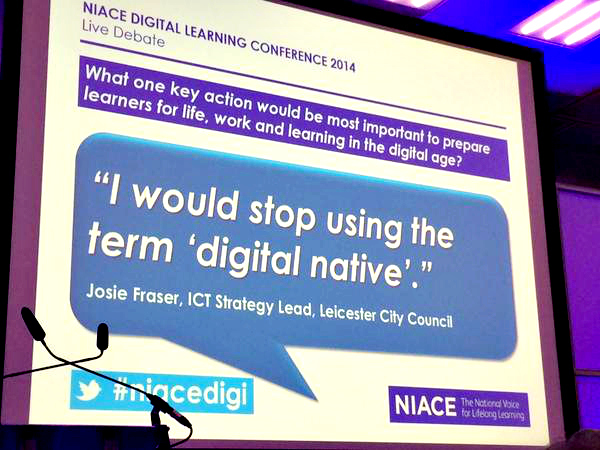 NIACE, the National Institute of Adult Continuing Education (the UK’s lead organisation for lifelong learning) held its annual digital learning conference last week. I was very happy to be invited to contribute to the conference debate, ably chaired by Go On UK CEO Rachel Neaman. The term ‘digital natives’ was coined by Marc Prensky in 2001. It’s the most popular of several terms that characterise young people as different from those born before the early-to-mid 1980s –and brought up in a society where mobile, gaming and internet based technologies have become pervasive. Prensky describes this group as fundamentally different from those born later – not just culturally but neurologically – his writing at this time suggests that engagement with (then) new technologies from an early age means that the brain development of digital natives is significantly different from previous generations. Digital natives have grown up with technologies, and are “used to receiving information really fast. They like to parallel process and multi-task. They prefer their graphics before their text rather than the opposite. They prefer random access (like hypertext). They function best when networked. They thrive on instant gratification and frequent rewards. They prefer games to “serious” work” (Prensky, 2001). Digital immigrants have difficulty in accessing new technological cultures and practices, and are characterised as learning “…like all immigrants, some better than others – to adapt to their environment,” But “…they always retain, to some degree, their “accent,” that is, their foot in the past” (Prensky, 2001). This idea of a clear-cut, homogeneous generational divide has been disputed by researchers since at least 2006 – see for example, Digital Na(t)ives? Variation in Internet Skills and Uses among Members of the “Net Generation” (Hargittai, 2010); The Net Generation and Digital Natives (Jones & Shao, 2011); Beyond the Net Generation Debate: A Comparison of Digital Learners in Face-to-Face and Virtual Universities (Gros et al, 2012). The immigrants/native dichotomy has however persisted in its popularity. ‘Digital native’ recently made it on to the shortlist for the Chambers Dictionary word of the year and the nostalgic spectre of digital immigrants is periodically raised again. I’d argue that this popularity in part is down to its easy adaptability into a blunt metaphor of difference. This populist use equates young people’s immersion and proximity to mobile, gaming and web-based technologies with knowledge, skills and confidence. Young people are ‘good’ at tech stuff, older people aren’t. ‘Tech stuff’ is a thing, rather than a diverse, overlapping and developing landscape of technologies, practices and environments. Assumptions about young people’s familiarity with technologies risk exacerbating inequality. Access to devices and connectivity isn’t equal across all young people, and neither is support in developing skills – from peers, parent/carers, or schools, equally distributed. Socioeconomic status remains a key issue in relation to access, with a small but significant number of young people having very limited access. We need to continue to challenge unhelpful assumptions and stereotypes about people based on when they happened to be born, and ask people what they mean when they use these terms. Native and immigrant assumptions obscure the actual picture for both younger and older people. We need to ensure learner of all ages have access to the knowledge and skills necessary to make to most of technology in terms of educational, social and economic opportunities and challenges. The DigiLit Leicester project is a two year collaboration between Leicester City Council, De Montfort University and 23 secondary and specialist education schools. Leicester’s secondary and SEN schools collectively support over 20,000 learners each year, with the majority of learners being between 11 and 16 years old. The project focuses on supporting secondary school staff in developing their digital literacy knowledge, skills and practice. A digital literacy framework was developed in consultation with the schools, embedding digital literacy within secondary school practice. From this, an online survey was developed, designed to support staff in reflecting on their use of technology to support teaching and learning, and to provide individual staff members, schools and the Council with information to inform future planning around professional development. The survey was opened for a second time between March and May 2014, seeing an increase in engagement from schools. 701 members of staff completed the survey in 2014, or 39% of all eligible staff, with 209 taking part for the second time in 2013. 56% of staff across the city who participated in the survey classified their skills and confidence at the highest level – Pioneer – in one or more of the six key digital literacy areas. 23% of all those who participated in the survey placed themselves at Entry level in one or more of the six key areas. Staff rate their skills and confidence highest in the area of E-Safety and Online Identity, with 43.5% of respondents scoring at Pioneer level. Staff feel least confident in the area of Communication, Collaboration and Participation, with 9% of staff rating themselves as Entry level and 38.7% falling within the lower levels of the framework (at either Entry or Core level). In Creating and Sharing , 42.1% of staff rated their skills and confidence in the lower levels of the framework (Entry and Core levels). Analysis comparing the survey data from 2013 and 2014 shows that a statistically significant change in staff confidence has occurred, with 21% of participants registering an increase in their skills and confidence. Levels achieved increased in five of the six key areas (excluding E-Safety and Online Identity, where levels were already high). 3. Provide supported opportunities and resources specifically designed for and accessible to Entry level staff, particularly in relation to Assessment and Feedback and Communication, Collaboration and Participation. As ICT Strategy Lead (Children's Capital) at Leicester City Council, I'm responsible for investment, management and development work relating to technology on the city-wide secondary school building programme. The LRC Connect school library project ran as part of our staff development programme, and supports the promotion and development of digital literacy across the city. What follows is the summary of the project. Many thanks to Lucy Atkins (Leicester City Council), Richard Hall (DMU), Deb Siviter (Library Services for Education), David White (University of Oxford), Laura Taylor (Taylormade Libraries), Lesley Martin (School Library Association), Rachael Guy (Berkhamsted School) for their invaluable support, and a huge thanks to all of the school librarians and library staff who took part. The BSF Programme in Leicester includes 23 secondary schools, 2 of which run at multiple sites. All 16 mainstream schools in the Programme will offer on site Library or Learning Resource Centre (LRC) provision. Of these 5 are already complete, 2 are due to open in October 2013, with the remaining projects to be completed by 2015. Levels of provision in the 7 small and SEN schools vary, in relation to library space and staff. The LRC Connect Project ran from May 2012 to November 2012, supporting the investment being made through the BSF Programme in these spaces, particularly in terms of ICT infrastructure, systems and devices. The project aimed to support schools in ensuring that the potential of their library service and space is realised. Young People identify the school library as an important, unique and valued area within the school. They ask that the BSF Programme look at what the library was for and how it was used. They want the role of the library to be extended and promoted as a place to relax as well as learn. School libraries are particularly valued as quiet, calm spaces, encouraging and supporting informal learning and learner-directed research. Library space was identified as supporting both independent individual and group learning, both within and as an extension to the taught curriculum. Most young people expect the library spaces to offer both digital and physical resources i.e. computers should be available with wifi access. They would like to have support to use the technology and web-based resources for research and learning. Supporting schools in the process of building new school Learning Resource Centre (LRC) or library spaces, or rethinking the use of current spaces. Providing librarians and school leaders with access to library design expertise and information about effective library space design. Providing school librarians across the city with information, support and training about ways of using technology creatively and effectively to support learners, promote services and share resources. Supporting librarians to become connected learners and undertake short projects that supported their own professional development and benefited their school community. Providing networking opportunities for school librarians and library staff, and supporting them in connecting to professional associations and expertise. Reviewing the ways in which existing library services connect to and support other departments and projects across the school. Introducing librarians to a range of web based technologies that support collaborative and networked practice. The six month project started in May 2012. All Leicester BSF schools were invited to participate. School Librarians, Learning Resource Centre Managers, and other staff members from 13 city secondary mainstream and 3 of the small and SEN schools attended project events. Many of the participating schools were able to send 2 or 3 representatives to events. The project consisted of three face to face events, one online meeting and independent project work undertaken by participants. Participants were not required to complete any additional work, but we provided individual support as required for staff that chose to undertake a project. Attendees varied in terms of their skills and familiarity with the use of technology to support learners and promote their libraries. All of the attendees were keen to explore the use of technologies to support their roles and to learn about new resources and practices. Experts from across the UK provided staff with the latest research, thinking and practice. Laura Taylor (Taylormade Libraries) looked at school library design and use of space. David White (University of Oxford) talked about the search, evaluation and study skill strategies learners currently use, and how librarians could help make these more effective. Rachael Guy (Berkhamsted School) shared her experiences of managing a school library, prioritising technology for learning, and supporting learners in using technology effectively. Representatives from the School Library Association, the national professional body supporting school librarians and libraries, and from Leicestershire Library Services for Education – our local support service, providing schools with books, resources, advice and training, also contributed to the day. This meeting provided participants with an introduction to and the opportunity to use an online conference environment (in this instance, Blackboard Collaborate). 6 schools took part. Attendees used the platform to present and discuss their initial project ideas and progress. Some of the attendees had never used online conferencing, voice or video services before. The meeting gave participants an opportunity to visit one of the more recently built school LRCs, and discuss issues relating to library management, layout and technologies. 9 schools took part. Lucy Atkins, Leicester City Council’s Digital Literacy Research Associate, provided the group with an introduction to augmented reality (AR) and QR codes, bringing the group up to speed with some of the ways in which school librarians are using these technologies. Staff from Secondary, Junior and SEN schools across the city were invited to attend the project cycle close event, which was run in partnership with Whatever it Takes, the Leicester City reading initiative. The day conference focused on technology for reading and literacy. The day provided LRC Connect group members and staff across the city with an opportunity to hear from and question expert speakers, attend workshops, and network. Representatives from 16 BSF secondary, small and SEN schools attended the Book IT event. Babington Community College, The City of Leicester College, and Hamilton Community College LRC Connect members were given the opportunity to demonstrate and develop their public speaking skills and promote their schools by presenting their projects to all conference attendees on the main stage. Workshops for delegates included using and creating e-books, citizen journalism for schools, weblogs and blogging to support literacy, the use of computer games to support reading, and using Twitter to develop Personal Learning Networks. Babington Community College (Rob Povey): Using QR Codes and iPads in the library during induction to help familiarise year 7 pupils with the library. The City of Leicester College (Madeleine Beach): Creation of a school library blog to showcase students’ book reviews and encourage reading for pleasure. Fullhurst Community College (Nicola Buttery): Working with e-Reader devices to improve learners reading ability and attitudes towards reading. Hamilton Community College (Sharon Dilkes): Setting up and managing a Facebook group to support GCSE study and revision skills for Year 11 students. Sir Jonathan North (Meena Bhatt Vyas): Resources for digital referencing, to support learners in understanding how to consistently and appropriately reference web pages, blog posts and other online information. You can find more information on the school projects over at the Digitlit Leicester project blog. Leicester schools are committed to matching the infrastructure, systems and technologies we are investing in with innovative and effective library use. 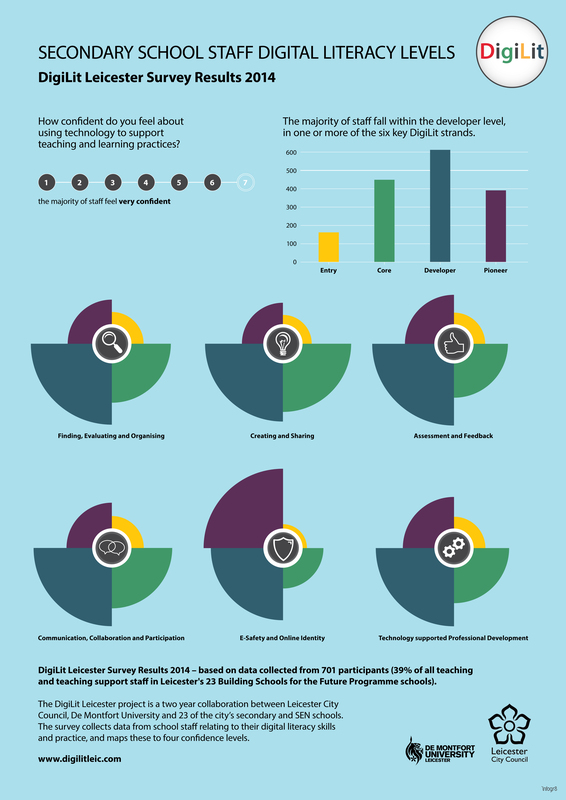 Our schools are at different stages in terms of making best use of technologies to support learners, and in ensuring that advice, guidance and support extends to digital practices. Our learners use social networks to discuss their homework, they look for information and resources online, and they complete activities and study in digital environments. It’s important then that schools are able to support learners in using technologies to improve attainment and achievement. The school library should be a key resource to support study skills, information management, and to promote reading for enjoyment. Here are our top 3 recommendations to help school leaders ensure their school library service is taking the best possible advantage of technology to deliver services and support whole school improvement. Any activity that just involves looking something up isn’t much of a learning activity in the age of Google. Schools need to focus on enhancing students existing skills and practices – their approaches work, but we can help them understand why and make them even more effective. School librarians need to be experts in digital search, evaluation and referencing. They need to understand how young people find and use online environments and resources, so that they can support learners to enhance these with a range of evaluation strategies. The school librarian should be able to understand, support and connect the work in this area across all subject areas, so that teaching staff are being consistent with guidance and support. It is critical schools ensure that the study skill support and advice given to learners also includes digital search, evaluation and referencing. The school librarian is ideally placed to support this, however, where a qualified librarian or equivalent post holder is not in place, a senior member of staff should take responsibility for ensuring consistent and accurate information and support is available to all learners relating to search, evaluation and the appropriate use of digital resources, across all curriculum areas. Participation in the wider City Council’s Digital Literacy Framework project – Digilit Leicester – will help school staff to reflect on where they are in terms of their knowledge and practice relating to the use of technology to support learners and learning. The framework area Finding, Evaluating and Organising directly addresses search, evaluation and a range of skills relating to the use of digital information and resources. There are free, high quality online resources to support staff and librarians – for example, the Open University’s Being Digital site houses a collection of short study skill activities, including search, evaluation, communication and sharing online. The Google Search Education site carries resources relating to search and evaluation skills to take staff development forward and activities to support learners. Libraries need to be multi-function spaces – and design and planning needs to reflect this. School libraries need ample storage, shelving and display space; room for fixed computer stations and for mobile device storage; seating and desks for a whole class, and informal seating options for individual study; digital display and presentation technologies (for example, an interactive projector). In April 2012 we produced and circulated a guide to school library design issues, Designing 21st Century Libraries/Learning Spaces (PDF) (Word). The SLA run an annual competition for School Library Design. Even if you are not considering entering, the guidance notes are well worth reviewing. Previous competition winners have included a wide range of older as well as new libraries – it rewards innovation, creativity and resourcefulness in the use of making the most of library space. Participants enjoyed their engagement with the project, the support we were able to provide, and appreciated the opportunity to learn more about ways in which technology is being used to support school libraries. The ability to network with and interact with other library staff was identified as very beneficial. It's important that librarians are able to keep up to speed with developments across their field. They need to be familiar with standard library technologies, for example library specific software, as well as the range of technologies, platforms and approaches that can support learners and enhance learners experience of reading, literacy, study and revision skills. Many school librarians take responsibility for supporting accelerated reading schemes. All librarians will have to support students with learning difficulties or disabilities. Librarians need to be confident and familiar users of technologies and approaches to help learners overcome the range of different challenges they face. We recommend that the ways in which librarians are making use of technology is included in discussions and planning related to the school’s appraisal and evaluation of how the library is supporting the school community. Looking at developing specific new ways of using technologies in the library, with all learners or with targeted groups, and evaluating these, could form part of the school’s yearly strategic plans. Professional development is not something that should be viewed as just training course attendance. Staff should be encouraged to develop their own independent learning skills, and develop their own professional networks to support on-going development. One of the Digitlit Leicester Project strands, Technology supported Professional Development, focuses on this, and is designed to support educators and school communities to participate within, develop, create and manage web and mobile-based communities of practice, or Personal Learning Environments. Engagement in networked learning practices supports the development of digital literacy, and ensures that people can create and engage in networks that are specific to their (and their learners!) needs. An important part of on-going professional development opportunities for the school librarian and resources for the school is membership of a professional association. Is your school benefiting from national and local support, expertise and resources? Leicestershire Library Services for Education (LSE) – is local support service, providing schools with books, resources, advice and training. Again – feedback from librarians who participated in the project was that membership was very valuable to both them and their schools. LSE user groups meet termly and provide free CPD for all school library staff. City specific network meetings are also being organised by LSE in conjunction with Leicester Libraries. The School Library Association (SLA) is the national advisory and information service for school libraries and librarians. They provide a wide range of support to members, including at regional level. Feedback from project participants who are members was extremely positive in terms of the quality and usefulness of support offered. I see digital citizenship as a distinct but overlapping area in relation to digital literacy. Digital literacy is the ability to use, critically engage with and make use of digital tools and environments – it’s not just about supporting learners to understand and engage with the world, but about enabling learners to challenge, shape and change their worlds. Digital citizenship for me addresses political, economic and legal participation in relation to the use of technologies and online environments. It isn’t an ‘add on’ to the area of citizenship as a whole, but a recognition that technologies and digital environments are a part of the real world, and they mediate all aspects of UK life: from meeting partners, finding jobs, contacting the local council, protesting, organising, developing our social and professional networks – the list goes on. Children and young people grow up and develop their identities in both physical and digital environments. While they might be confident users of mobile and gaming technologies, and online sites like Facebook, YouTube, Wikipedia and Google, it doesn’t follow that they are socially and politically aware and engaged citizens in these spaces – just as simply being in the physical world doesn’t guarantee they have the tools and self confidence to understand their rights and responsibilities, and to take an active part in their communities and in governance. Many of the issues addressed through citizenship education are inseparable from the use of technology and digital environments, and I’d like to see citizenship within the curriculum reflect the realities of learners lives. Although it obviously depends on the teacher delivering the curriculum, typically schemes of work and lessons don’t address rights and responsibilities in digital environments, or political and legal issues online, or identity, conflict, and communities in online environments. The internet is still broadly framed as a place to get resources from, rather than as an active site of political life. There isn’t a transparent relationship between how we act, are acted on and represent ourselves in physical environments and how we act, are acted on and represent ourselves in digital environments. While most of the key concepts of citizenship education apply to activities in online environments, a range of digital-specific issues have been left largely under explored. I’d include issues around the use of technologies for mainstream and grassroots political organisation and representation, the use of technology for governance and decision making, freedom of speech and censorship, digital copyright laws, privacy and data protection, harassment and discrimination. These are all issues that impact on young people’s lives and their everyday use of technology that we aren’t addressing at national level. Citizenship is a social responsibility. Any citizenship agenda that stops at ‘behaving well’ is potentially a dangerous one – the point of citizenship is not just to understand and do what you are expected to do by your community and by law. Citizenship should be about equipping young people to actively and critically engage in the local, national and international agendas and decision making that affect their lives and the lives of their communities. There are specific social, economic and political differences, as well as significant similarities, when it comes to rights and responsibilities in physical and digital environments. The social and legal challenges that life online pose are substantial and changes in these areas are rapid. The integration of mobile, gaming and web based technologies into everyday life means that new social norms are emerging and being argued over now. Privacy is one of the key examples of this. What is a reasonable expectation of privacy, at time when many people are publishing personal information about themselves online? How do laws that aim to regulate and monitor online and mobile activity in order to protect people impact on our individual rights to and expectation of privacy? How are companies whose income is based on the tracking and selling of user activity data regulated? Schools have a critical role to play and I would love to see citizenship education really get to grips with digital issues. Parents and carers, as citizens themselves, are having to engaging with digital citizenship issues, and I think there is a huge role to play for parents and schools supporting young people in using and understanding the ways in which technology can help them organise – school councils have a vested interest in active engagement in the digital citizenship agenda. Young people are already using Facebook, Twitter and mobile technologies to effectively organise campaigns, protests and establish their own interest groups. How are we supporting them in this? What can we learn from them? I’d identify three priorities in taking forward digital citizenship education. Firstly, schools need to understand the importance of digital literacy for all staff members, as well as for all learners. If a school doesn’t have an appreciation of the critical role technology can play in learning and teaching (and that it already does play in informal learning and in the social life of its community) it’s missing out on key opportunities to support all learners. Secondly, national and local citizenship education needs to integrate digital citizenship into curriculum design, resources and delivery. Thirdly, students need to be supported in their use and understanding of mobile and web based technologies, tools and environments for organising, collaborating and for governance. It's almost time for TeachMeet SEN 2012! Last minute tickets available here. Signups for TeachMeet SEN 2012 have gone really well. School, University and Local Authority staff have signed up from across the UK to come along, network, learn and present this Saturday in Leicester. Our TeachMeet focuses on practice that works for learners with Special Educational Needs – learning difficulties or difficulties which make it harder to learn or access education. According to 2010 Governement figures, approximately 21% of all pupils in England where identified as having SEN.
TeachMeet SEN 2012 follows the traditional format of practitioners talking about and demoing practice that works, in 7 minute micro presentations or 2 minute nano presentations. Sal Cooke, Director of JISC Techdis, one of the leading UK advisory services on technologies for inclusion. Sal has overall responsibility for the strategic focus and direction of JISC Techdis as guided by funders and stakeholders, ensuring it continues to be the pragmatic voice of inclusion and accessibility and promotes the innovative use of technologies, to support users within education, business and community sectors across the UK. John Galloway, an ICT/SEN Advisor in Tower Hamlets, a consultant to a number of special schools going through BSF across London and Essex, and a freelance writer with several books and many articles to his name. He has been using computers with learners with a broad range of special needs since the mid-1980s and still gets excited by what technology can enable them to do. Bev Evans (@bevevans22/@TES_SEN) is the new Subject Leader of SEN Resources at TES – and spends time sourcing and creating resources and guidance to help support teachers, who have pupils with SEN, within the classroom. She also spends time visiting schools and events to find out what sort of resources practitioners are currently looking for to help support their work at school and beyond. Our panellists have been asked to set out the current agenda for technologies for inclusion, and present and defend the issues and areas they have identified as current national priorities. Our speakers have outlined their priorities – what do you think? Which of the panelist priorities resonate most strongly with you? Do you think there is a more pressing issue? Let us know and join in the debate by voting for the priorities you think are the most important, or contributing your own suggestions, either when you vote or in the comments below. What is Assistive Technology in 2012? – or should we now call it something else? As more and more of the mainstream technologies, including some free or very low cost solutions are displaying and integrating features that can aid our learners in a myriad of ways, how do we need to think and re think what we “buy” download or access as assistive technologies? The Assistive Technology companies themselves are now operating in a very different world and equally so are schools, colleges and universities and of course so are learners and their families. As a recent addition to the BATA Council I am very aware of the different pressures in this economic climate for both industry, and from my role as Director of JISC TechDis for the learning providers where the impact of technology (financial or pedagogical) can have such an impact on learners with specific needs. What about the people? How will they gain the skills and knowledge about Assitive Technology in this ever changing world? With the advent of apps, tablets, gesture based gaming and all manner of hand held devices – how do we expect staff to keep pace and obtain best value, the best information, and most of all the best for their learners? The moves within the industry to more and more freemium offers and services could radically help schools and Local Authority budgets – but how do we know? Where are the sources of information? Do we need to be radical with mandatory training - what about teaching and learning, and budgetary implications? The recent post-16 Ofsted review recommended that the Department for Education and the Department of Business Innovation and Skills should jointly create a database of assistive technologies – is that a viable or desirable solution? With disability becoming more prevalent, why is accessibility optional? We know that about twenty per cent of school children will have some sort of SEN, about half of them struggling with text. We also know that computer systems aren’t specially made for school children, they are made for average adults – it’s Microsoft Office, after all. But we also know that in Europe we have an ageing population which is leading to increasing numbers of people with disabilities, approximately 80m at the moment. And we know that adopting a principle of ‘inclusive design’ makes life easier for everyone. So why do we have ‘Accessibility options’ on our computers, instead of ‘Accessibility by default?’ Many aspects of improving access – high contrast, variable colour schemes, enhancing the cursor – would work for most of us (if we knew about them) These should be the defaults. Online communities promise so much for those with SEND, so why aren’t they more accessible? families and carers don’t appreciate what it offers. As it stands, social networking can exacerbate a digital divide, that it could so easily help to bridge. How do we stop schools from being left behind in the technology stakes? As technology becomes more and more important in schools around the country what can be done to help those pupils in badly funded areas progress or have the access to the equipment they need? Some areas within Wales are particularly lacking in funding or support in this important area ( I am sure this is true of other areas within the UK too) – is it really good enough that this is still happening in 2012? Why is support for pupils with SEN so patchy across the UK? Is it purely a funding issue or are other things contributing? In my area of Wales I have always been aware that many parents of children with SEN, in particular those with children who have autism, move into the county to access the provision available. I’m also aware of this happening between schools across Wales and, from the emails or messages I get through position at the TES, it is obviously something that happens elsewhere in the country too. Why do some school or LAs put less effort into properly supporting and addressing the needs of pupils with SEN? Is it always a funding issue or do other factors come into play? You can vote here for the priorities you agree with, suggest additional priorities or leave your comments below.